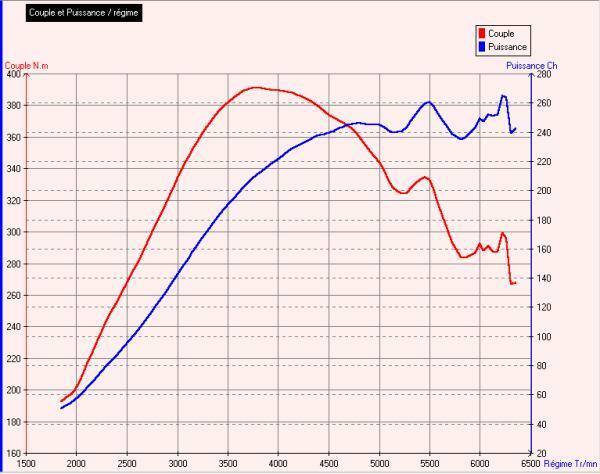 Here are the power/torque curves of the original 2.8L no cat engine. The measures have been obtained from the car acceleration measures (5% precision). The original engine management limits the boost level at 800mbar. The following picture shows the pressure values on the boost gauge. So the original boost level is 800mbar. This is rather low even for very usual IHI turbos and especially the 7.3:1 CR level. I discovered that both the ignition/boost and injection computers (ECU) contain maps going up to 1bar and that pressure sensors go up to 1.5 bars. The boost is controlled by the ignition ECU by mean of a three-way valve which creates an air leak in the wastegate control circuit (this is a very standard way to do). The ignition ECU firmware is adjusted to limit the boost at a 1bar level. But the boost valve was designed in such a way that even if 100% open it would limit the boost at 800mbar. In fact the ECU does not regulate the boost, it's a valve property. The ECU can only regulate the boost under this limit, which only happens when a knock is detected. 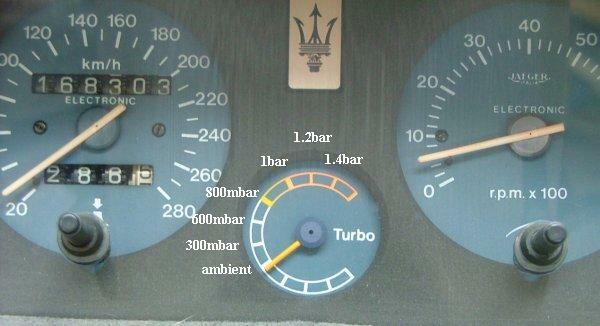 In order to get this programmed 1bar boost level the Maserati boost valve can be replaced with a modern pierburg valve coming from a diesel turbo. The same valves can also be found on the right side of the biturbo heater unit. 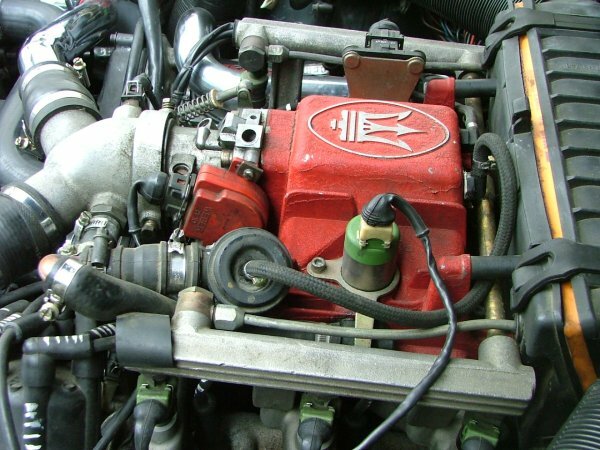 As dynamic properties of the Maserati valve are different from the ones of the new valve, the valve control assembler code must be adjusted (there is a constant 16bit value). The injection ECU contains a "security" feature that shuts the engine off if the boost reaches 1.2 bars. I think this feature is very dangerous so I'd like to take it out. Could someone tell me where in the ECU firmware is it programmed ? 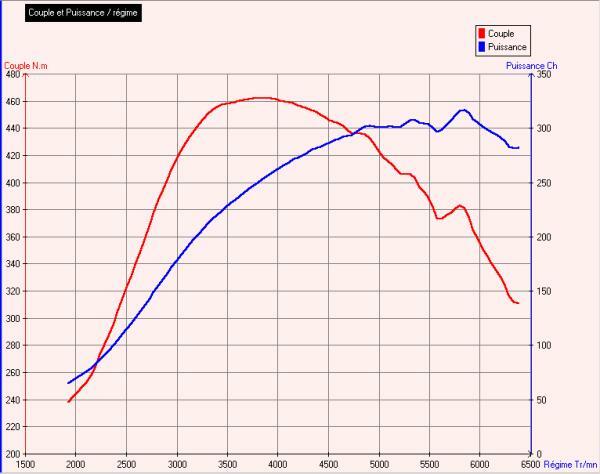 The following graph shows the power/torque curves obtained with a 1bar boost level. The power output is surprisenly high for the 18v chamber which looks very poorly designed. The 2.8L engine is an "old style" turbo, the whole boost comes at once and is very difficult to adjust while driving the car. So I've decided to link the boost level to the accelerator position, as it's made on modern turbo cars. The injection ECU uses a throttle position sensor and the ignition ECU has 3 extra analog inputs. The ignition ECU also has one extra op-amp. I connected the throttle signal to the op-amp through a free ECU pin, the op-amp being used as a follower. The op-amp output goes to one of extra analog inputs. I modified the boost control code in order to have 3 throttle position intervals which correspond to the 300, 600 and 800 mbar boost levels. The car is very easy to drive now. I installed a dump valve in order to protect turbos against the surge. 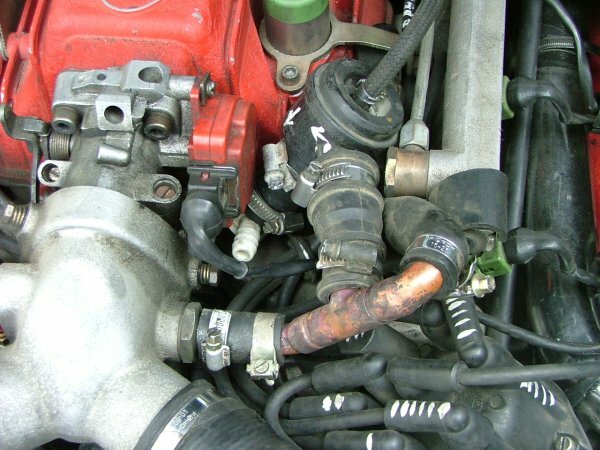 The only place where I found a possibility to make that is the idle valve bypass hose. I used a standart depression controlled dump valve with a no-return valve at the end, to prevent air entering the intake system during idle.